My Spa Resort is a simulation game that lets you build and manage a beauty spa. It’s a combination of several gameplay elements, including city building and farming. As a spa owner, your job is to open various treatments for your clients, harvest plants to make eco-friendly cosmetics and then use them to treat various clients at the hair salon, nail salon, massage studio and several other treatments. Your goal is to earn profits and expand your spa business so that more and more clients arrive at your spa for treatment. As you progress, premium clients will visit your spa and you will have to fulfill their special demands to earn more profits. As you progress and expand your spa resort, you will come across several guests with several demands. You can know a client’s requirements beforehand by tapping a treatment and then tapping his/her portrait. You will see all cosmetic requirements of that client on the left side of the screen. As clients queue up near the big guest house, you will see more portraits pop up above a treatment. 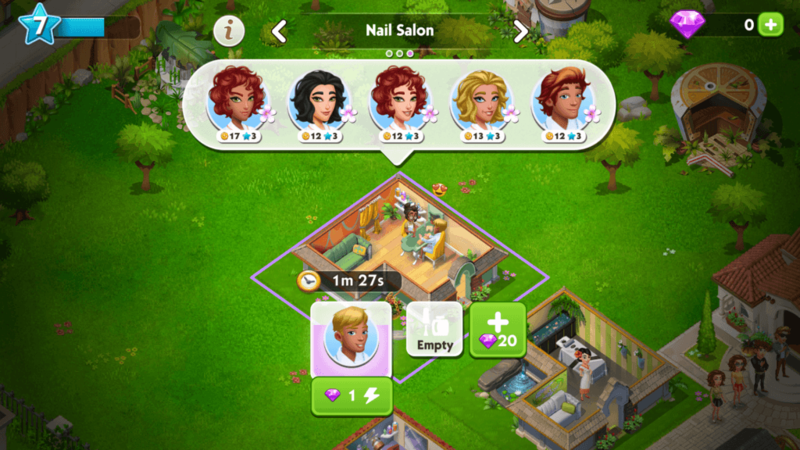 Just tap a treatment and then tap each client’s portrait to know their cosmetic requirements. Make the required cosmetics at workshops and then begin their treatment to get coins and XP. Knowing a client’s requirements in advance will make it easy for you to manage your spa resort and complete treatments in a more systematic manner. It’s always wise to know their demands before you start making cosmetics or harvest plants. You will also save a lot of time and coins as you will have to clear idea of what to produce and harvest first. Note: Most clients not only require cosmetics but also plants. Make sure you seed and harvest plants so that you can complete all client requirements. 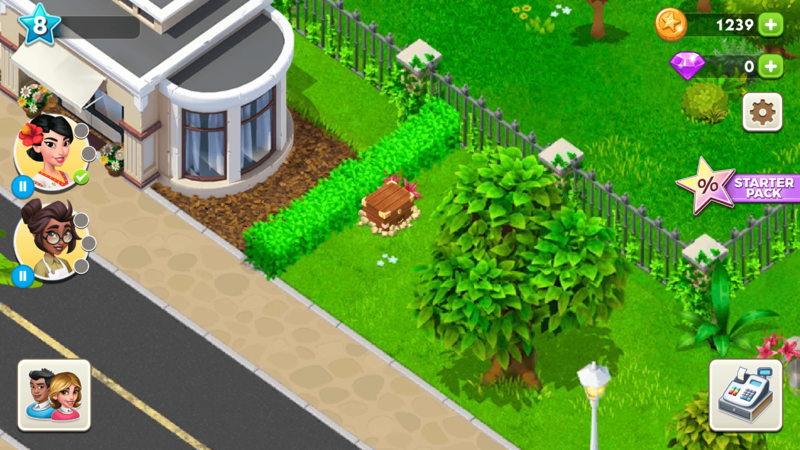 Plants play a vital role in My Spa Resort. You will need them almost every now and then to produce cosmetics for your clients at various treatments. Each client has a unique requirement, which is why you should first tap his/her portrait above a treatment to check what are their cosmetic needs. From level 3 onwards you will begin acquiring various plants, such as Aloe Vera, horsetail etc. You will have to seed them on plant fields, wait for a few minutes and then harvest them when they are ready. Once they are harvested, you can use them to make cosmetics. As soon as you harvest plants, you should plant more seeds by tapping a field and then dragging a plant onto it. Do this regularly to stock up on important plants for your cosmetics. Next, tap a workshop or “maker” and then tap and hold a cosmetic to check its requirements. For example: The “Regenerating Shampoo” requires 2 Aloe Vera, so you will need to stock up on 4-6 Aloe Vera if you want to make 2-3 shampoos. When you begin playing, you will just have six patches of “plant fields”. You will be able to build more fields when you reach level 5. 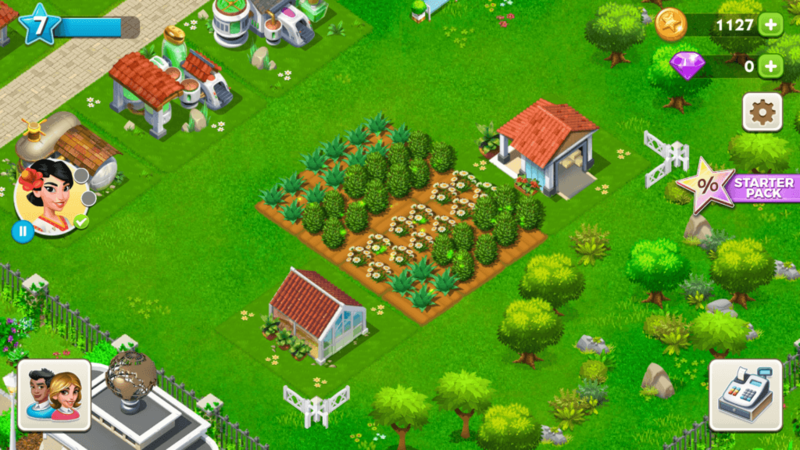 Keep reaching new levels to unlock more fields and don’t forget to place them next to other fields to expand your farm. You will then be able to plant more seeds and harvest more plants. Tip: When you harvest plants, you also gain some XP. Seeding and harvesting plants is the best way to get XP quickly. Collect XP to level up and unlock more workshops, plants and catering shops. Time is precious and, in your spa, time is money. Make sure you keep all beauty experts busy by keeping your treatment queues full. Do this for every treatment. You will have two empty slots for your guests per treatment facility. Once you know all clients’ cosmetic requirements, start making them in workshops and stock up on all required cosmetics. You will then see flower pins on top of each client’s portrait. Drag clients on all empty slots in each treatment to keep queues full and while your beauty experts are busy, don’t forget to seed more plants and make more cosmetics. As treatment for the current lot begins, there may be a shortage of cosmetics for the next set of clients that are not in queue. My Spa Resort is all about managing customers and time and so it’s important that you stock up on plants/cosmetics and use them to treat guests whenever they need them. You can unlock a third slot using gems, but do this when you have gathered a whole lot of gems. Save gems for important tasks as they are premium currency and rare to acquire for free. When you tap a treatment facility, you may notice that some guests are usually paying a bit higher than others. Well, you should tap their portraits and check their cosmetic requirements, create them and then drag their portraits on the empty slots to treat them first so that you get more coins and XP from them. 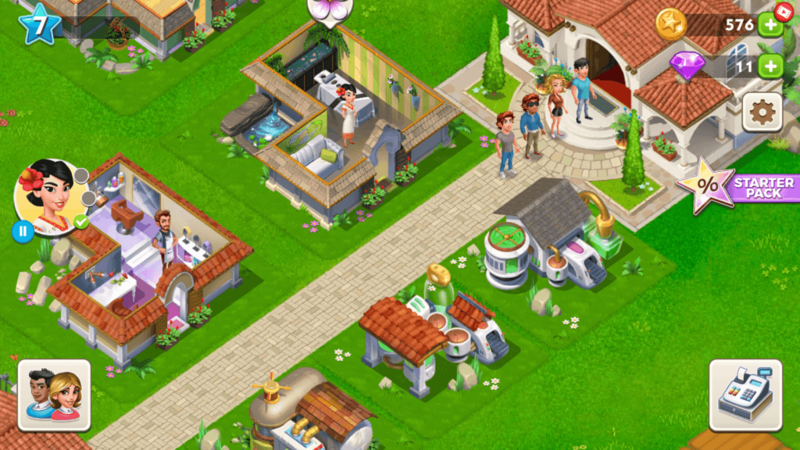 You would want to expand your spa to place more treatments, workshops and plant fields. Expanding your spa will require more land and for that you will need to clear obstacles, such as trees, rocks and shrubs. Land can be unlocked using certain items, such as the hoe – a garden tool. You can get this tool by completing tasks, which will be displayed on the left side of the screen from time to time. You may also receive such tools from the big gift box, which you receive when you complete all tasks of a premium client. If you are impatient and don’t like wait times for harvesting plants and making cosmetics, you can buy cosmetics and plants from your beautique shop. You will unlock beautique when you reach level 7. Tap the building and then tap “Global Offers” to get a list of cosmetics, tools and plants offered by players from all around the world. You can get them at reasonable prices. Always compare prices of the same product before purchasing them. 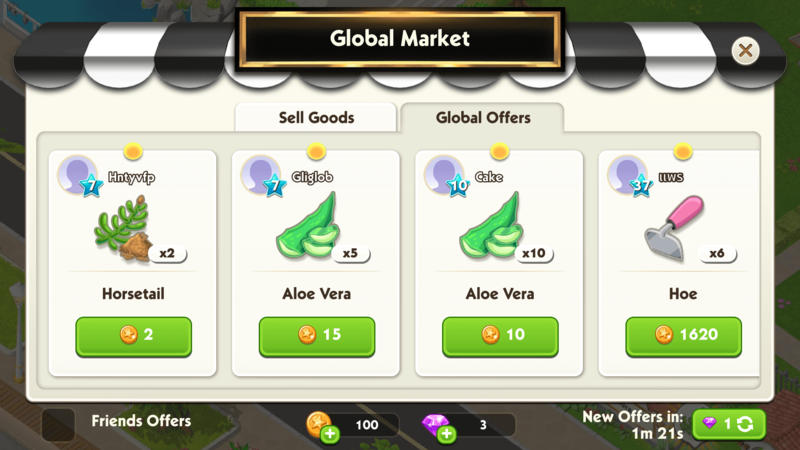 In the screenshot below, someone is offering 5 Aloe Vera for 15 whereas another player is offering 10 Aloe Vera for only 10. Make sure you explore global offers by swiping left and then buy those that’s offered at the cheapest price. You can also sell plants, tools or cosmetics from your beautique. Just tap the “Sell Good” tab and tap “Add Offer”. Now select the one that you don’t need now and set a reasonable price. You can set a price of a product a tad higher than the asking rate, but don’t set a very high price. For rare products, such as tools, you should definitely set a higher price. Adding offers in your beautique is the best way to free up storage space. You will find storage buildings near plant fields. Tap any one building to check your inventory. You will notice two tabs – Plants and Products. Under plants, all harvested plants will be stored. Under products, all cosmetics and tools will be stored. You can upgrade storage using certain tools. In My Spa Resort, catering shops generate bonus coins every few seconds. You will unlock your first catering shop when you reach level 8. It’s called “Green Bar” and is located close to the premium suite of buildings. You will earn a coin every 30 seconds plus there’s a 1 percent chance for a bonus item. Keep a check on this catering shop and make sure you tap it when a coin appears above it. Coins don’t stack up so don’t expect your catering shops to generate lots of coins for you when you are away. 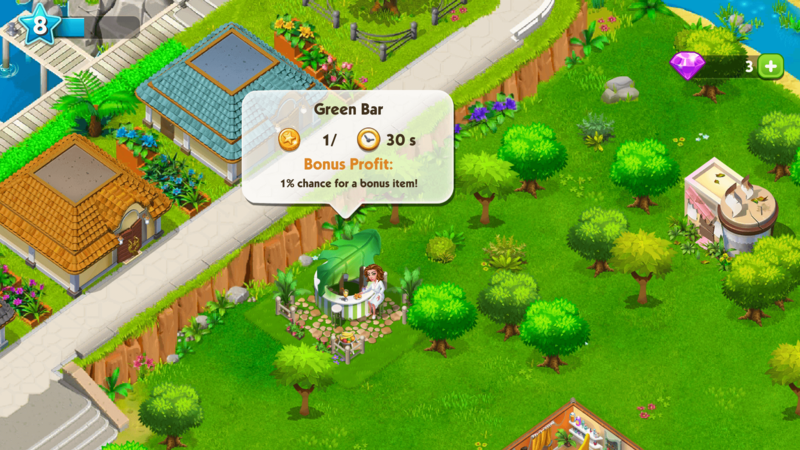 The Green Bar shop generates another coin only after collecting a coin. The next one called “Coffee Kiosk” unlocks at level 11. Another one called “Smoothie Shop” unlocks at level 16. These two catering shops are located close to your spa. Once you reach level 8, you will be able to fill booking schedules for various treatments to get awesome rewards. When you tap a treatment, you will see a booking schedule notepad on the right side of the screen. Filling up schedules is easy. All you have to do is treat a certain number of clients mentioned on the schedule to get your rewards. Each treatment’s schedule shows how many clients you need to serve to complete it. For example: In the Massage Studio, as shown in the screenshot, you will need to queue up and serve 15 customers shown in the booking schedule to get your special reward. If you don’t have friends yet, don’t worry! Martha’s here. You can visit her spa and purchase products (cosmetics, plants etc.) from her beautique. Just tap the friend’s icon on the lower-left corner of the screen in your spa and then tap Martha’s portrait. Now tap her beautique building to check items up for sale. Buy those you need the most. Martha stocks up new products ever few hours so check back when they are ready. She usually sells products at a price cheaper than other players so make sure you visit her beatique first before purchasing products from global sales in your beautique. You will open the first “Premium Suite” when you reach level 6 in My Spa Resort. In a premium suite, special clients such as celebrities and actors stay. You can treat these premium clients to earn more profits. When you see a premium client in a suite, tap the building to check his/her treatment requirements. These requirements not only include cosmetics but also certain “enhancements”. 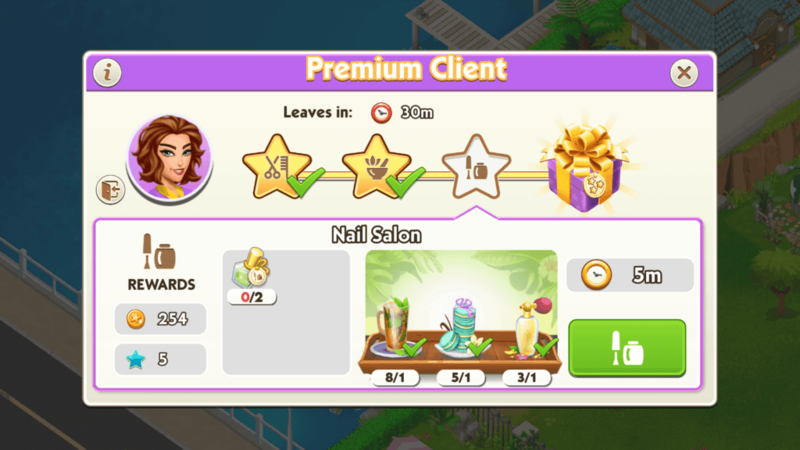 A premium client usually books three different premium treatments, so make sure you check each treatment’s special icons on the premium client’s window (these special icons show up when you tap each treatment building in your spa). When you meet all requirements for a particular treatment, just tap the green button on the right side of the premium client window to treat the premium client. For example: For the massage studio premium treatment, your premium client may need a horsetail plant or a regenerating shampoo + certain enhancements. Once these requirements are met, tap the green button and he will move to the massage center for the treatment. When the treatment is over, you will get coins and XP. You will then have to complete premium client requirements for other treatment centers, such as the Hair Salon and the Nail Salon. Once you treat premium client on all three treatments, you will receive a special gift box which may contain obstacle clearing tools, storage upgrading tools, gems and coins. Make sure you treat a premium client before time runs out. You will see how many hours are left until he/she leaves the premium suite. The enhancement shop is located just next to your beautique shop. The game offers several enhancements in the beginning so you don’t have to spend anything. You may have to purchase enhancements using gems. However, there are a few ways to get free enhancements. You can find them in rewards from completing story tasks or from booking schedules. I don’t think one can sell or buy enhancements at the beatique, although it would be a great idea to lots of profits as they are rare to find. 1. Complete story tasks shown on the left side of the screen. Stories usually revolve around your clients. You will special rewards, such as gems, coins, tools to remove obstacles and upgrade your storage buildings. 2. Look for treasure chests lying on random areas in your spa. A treasure chest usually contains coins, although you may find important items in it. 3. You can upgrade storage using certain tools, such as “measure”, nail and screwdrivers. You can get these tools from story tasks or from a special gift box you receive for completing all three premium treatments for your premium client. 4. Double your daily rewards by watching a video. You will receive coins daily so don’t forget to play my Spa Resort every day. 5. You can find more friends by logging into Facebook via the game’s friend finder. You will also receive 5 bonus gems for logging in. 6. A man with a skateboard appears just outside your spa. Tap him to get plants and cosmetics for free. You will have to watch a video to get your rewards from him. 7. You can get free gems when you level up, from premium client gift boxes, or by watching a video. Tap the plus sign beside the gem icon on the upper right corner of the screen and then tap the play icon under “Free” to geta gem.